Ever seen a jellyfish washed up on the beach? Ever gotten stung by one? Most people don’t have very favorable views of jellyfish. I’m getting to spend a lot of time with them lately, and I am developing an appreciation. 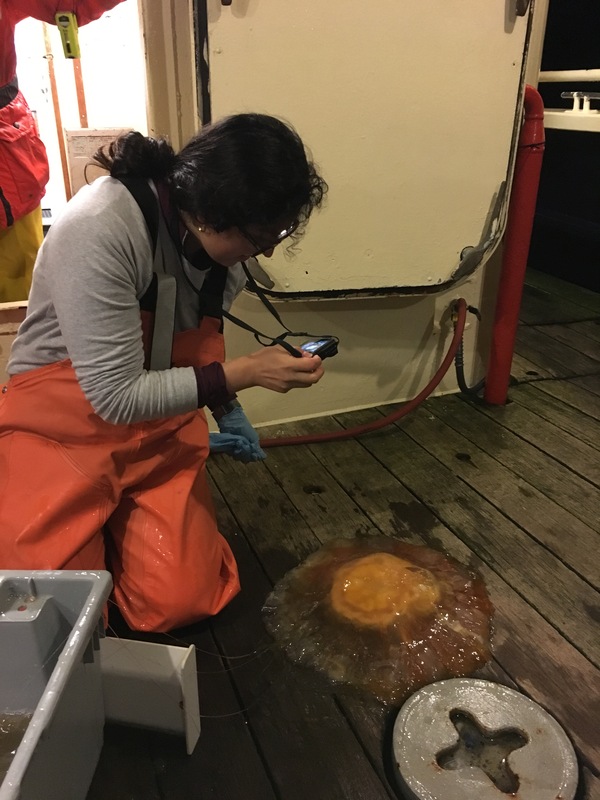 We have a graduate student on board studying the interactions between fish and jellies. Her enthusiasm for them is infectious. Jellyfish really aren’t fish. They belong to a group called Cnidarians, along with corals, sea anemones, and hydras. It’s one of the most primitive groups of animals on the planet. Ancient and simple, Cnidarians have two tissue layers, a defined top and bottom, but no left and right symmetry and no defined digestive or circulatory systems. Jellies have simple nerves and muscles. They can move, but they are unable to swim against oceanic currents and therefore travel at the whim of those currents. Jelly tissue is made of a collagen protein matrix and a lot of water. I have heard one scientist call jellies “organized sea water.” That’s really not too far off. Seawater has a density close to one kilogram per liter, and when you measure jellies, their mass to volume ratio almost always approaches one. Despite their simplicity, jellies are incredible predators. When we scoop them up with the Methot net, they often come in with small lantern fish paralyzed and dangling from their tentacles. Jellies possess one of the more sophisticated weapons in the animal kingdom. Located in their tentacles are stinging cells, called cnidocytes. These cells contain tiny, often toxic harpoons, called nematocysts. The nematocysts are triggered by touch and can deploy as fast as a rifle bullet, injecting enough venom to kill small fish or to give the person weighing the jellies a nasty sting. Holding up a Chrysaora (sea nettle) jelly. Jellies have not been thoroughly studied in the Gulf of Alaska, and the work onboard the Tiglax may take us closer to answering some basic questions of abundance and distribution. How many jellies are there, where are they, and are their numbers increasing in response to increasing ocean temperatures? In order to sample jellies each night, four times a night we deploy a Methot net. The Methot net is a square steel frame, two and a half meters on each side and weighing a few hundred pounds. It is attached to a heavy mesh net, ten meters long. Even in relatively calm seas, getting it in and out of the water takes a lot of effort. We have already deployed it in seas up to eight feet and winds blowing 20 knots, and that was pretty crazy. The net is attached by steel bridle cables to the main crane on the Tiglax. As the crane lifts it, four of us guide it overboard and into the water. 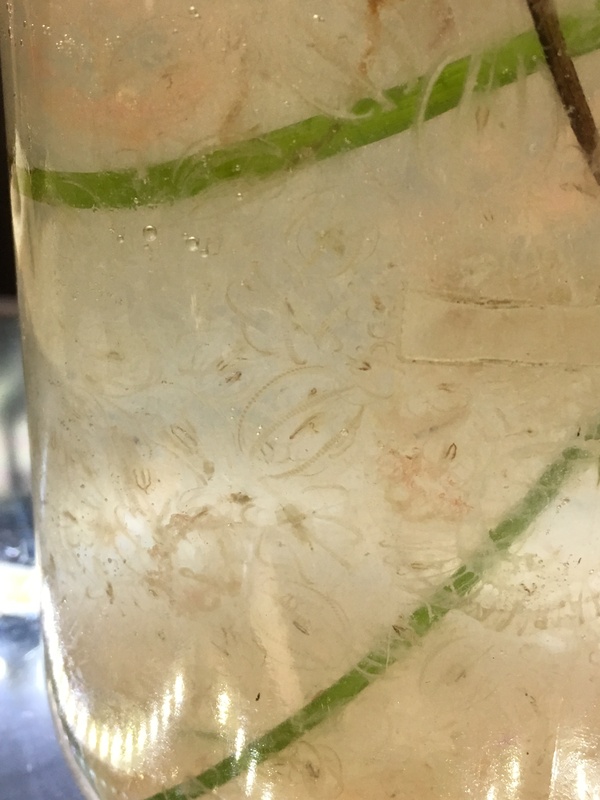 We leave it in the water for 20 minutes, and it catches jellies – sometimes lots of jellies. On still nights, you can sometimes see jellies glow electric blue as they hit the net. As we retrieve the net there are a few very tense moments where we have to simultaneously secure the swinging net frame and lift the jelly-filled cod end over the side of the boat. A few of the hauls were big enough that we had to use the crane a second time to lift the cod end into the boat. Smaller ctenophores (comb jellies) caught in the Methot net. Last night was tough. During our transit from the Seward line to the Kodiak line, things got sloppy. The waves got bigger, and their periods got shorter. To make things more uncomfortable, we were running perpendicular to the movement of the waves. I retreated to my bunk to read, but eventually the motion of the ocean got the better of me and I made my required donations to the fishes. The boat doesn’t stop for seasick scientist (or teacher) and neither does the work; at 11:00 last night I dragged myself from bed and reported for duty. The work on the Tiglax is nonstop. The intensity of labor involved with scientific discovery has been an eye-opener to me. We live in a world where unimaginable knowledge is at our fingertips. We can search up the answer to any question and get immediate answers. Yet we too easily forget that the knowledge we obtain through our Google searches was first obtained through the time and labor of seekers like the scientists aboard the Tiglax. 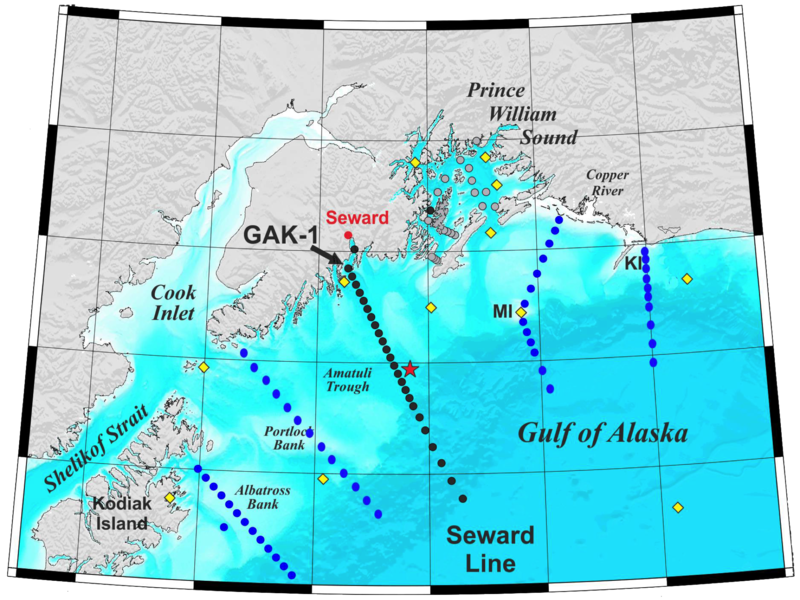 The goal of this project is to understand the dynamics of the Gulf of Alaska ecosystem, but one of the major challenges in oceanography is the vastness of its subject. This project contains 60-70 sampling stations and 1,800 nautical miles of observational transects, but that is just a few pin pricks in a great wide sea. Imagine trying to understand the plot of a silent movie while watching it through a darkened curtain that has just a few specks of light passing through. “Pinpricks in the ocean,” Transect lines for the North Gulf of Alaska Long-term Ecological Research Program. Storm petrels periodically land on ships to seek cover from winds or storms. They are one of the smaller sea birds, at just a few ounces they survive and thrive in the wild wind and waves of the Gulf of Alaska. Last night we had a forked-tailed storm petrel fly into the drying room as I was removing my rain gear between zooplankton tows. A softball-sized orb of grey and white feathers, it weighed almost nothing and stared at me with deep black and nervous eyes as I picked it up, wished it well, and released it off the stern of the boat. It was a cool moment. 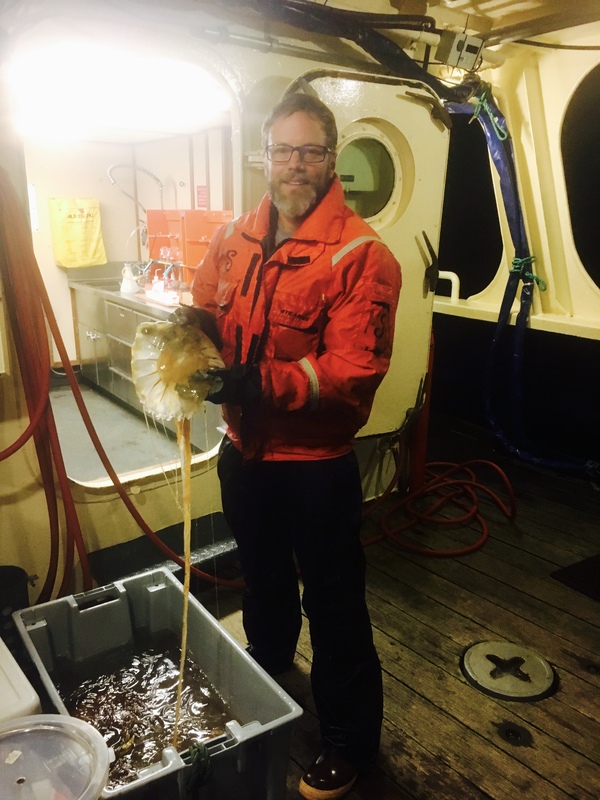 This entry was posted in 2018, Mark Van-Arsdale, NOAA Teacher at Sea and tagged Alaska, Gulf of Alska, jellies, Long-Term Ecological Research, R/V Tiglax, sea sickness, Seward Line Transects. Bookmark the permalink.